FocusFrame is very simple addon to show your focus. - Click to target your focus or your focus's target. - Shows your focus's health and mana. - Shows your focus's target. - Shows cast bar of your focus. - Supports Click-Casting such as Clique addon by utilizing ClickCastFrames. - Movable by dragging the title tab. The "focus" is a new feature of WoW API 2.0. Basically you can use "focus" as a second target. > and you receive unit events for this unit. > using secure templates or special slash commands (not /script). 3. HOW TO USE "focus"? by using new macro command "/focus" with target name or target id. your "sheep" to poly again. Example1: You can assist your focus by this macro. You may want to focus your main tank/main assist if you will do DPS. Or focus raid boss and 'assist' it if you are healing. Example2: You can cast your Earth Shock on your focus by this macro. You can watch spell casting bar on FocusFrame. position and FocusFrame will appear again at the center of screen. Updated for patch 3.2 .
erroneous behavior of positioning and scaling while scale is not 1. Copyed several new functions from Blizzard's TargetFrame. Bug fix: Debuff icons sometimes displayed target's debuffs instead of focus's. Bug fix: Sometimes failed to show Castbar after loading. It was not showing focus's name, debuffs, etc on the name bar. Updated for WotLK beta 9061. Now disables and replaces Blizzard's FocusFrame. TOC updated for WoW 2.4 . Fixed slash command "/focusframe hidewhendead" so that it respects Saved Variables. Restored dependency on the standard Interface option "Show Enemy Cast Bar". Added slash command "/focusframe hidewhendead" to toggle the new function introduced on 2.3.3 . Suports WoW patch 2.4 PTR. Added additional condition so that FocusFrame will be hidden only when focused target is dead AND is enemey. Added warning message for when too big scale argument is passed for /focusframe scale command. Added warning message for when user tried to change frame scale in combat. Updated for WoW client version 2.3 . Fixed a potential nil error. Updated for WoW client version 2.2.0 . Added slash commands /focusframe lock and /focusframe unlock. Displays maximum 32 buff icons. Added slash command /focusframe reset -- which reset window position to center of screen. Supported silver dragon decoration for rare-elite mobs. Added slash command /focusframe scale <num> -- which changes size of FocusFrame. Fixed broken initialization. FocusFrame window is now really displayed. First release. But initialization was broken. I love this addon because you can inspect your focus and follow. 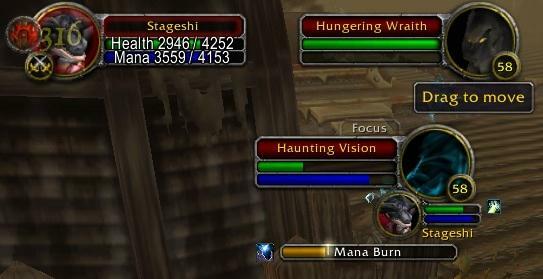 Is it possible to remove the Focus title to show nothing like blizzard focus frame? I don't suggest trying to mimic my FocusFrame for this specific purpose. My original FocusFrame was just a modification from Blizzard's TargetFrame. So I think you will be able to do the same for PlayerFrame. Tageshi I want to ask you a question about a FocusFrame modification I want to code, since you are a expert on the matter. I want to make the FocusFrame to look like the PlayerFrame (with the portrait on the left, instead of the right), basically "invert" the FocusFrame. I already have some experience coding addons. Can you give me some advice on how should I do it or what documentation should I study for the project? Last edited by Spyro : 11-02-12 at 07:07 PM. Updated for Mist of Pandaria for someone still using this addon. A bit late I know, but let me say thank-you for providing this addon while it was needed. The duty of my FocusFrame are finally at the end on this patch. And there is no reason to continue to use my FocusFrame. I recommend you to disable my addon. Thank you very much everyone for using my FocusFrame that long. Tageshi- Thanks for keeping FocusFrame working. It's a significant improvement over the game's default focus frame. I love your addon, but it seems that the frame is moved slightly on every login (? ), when using a scale != 1.0. I assume this is because of the code in TgFocusFrame_SetScale. Is there any chance you could "fix" it? Good report. I confirmed the problem. drop the fraction of them when logging out. That's how small move happens. Maybe it's extremely tricky to fix this. Well, amusingly enough--I went through this, and couldn't get it to happen. And now, it's not happening at all. I have this weird frame glitch happening. I think the only thing that could conflict with this addon is FluidFrames. Everything else I use is definitely unrelated. Last edited by koshiru : 11-08-08 at 07:00 PM.